During the Beta period, I had tried my hand at putting together several different stat blocks for the various beasts of the Star Wars universe for the Edge of the Empire roleplaying game as there were very few of them for public use, with mixed success. With a lack of anything better to do this evening, I started to look through some of them again. A few of them now have official stat blocks with the various releases, but a good number of them haven’t. So, I decided why not update a few of them and put them where the public can see them, use them, and abuse their players with them. I’ll start things out with the Wampa, guessing that it will probably only be a short few months before we see official stats for them in the Age of Rebellion Core Rulebook. Carnivorous predators native to the ice planet of Hoth in the Outer Rim, the Wampa is a savage beast that will attack anything they come across. However, they’re favorite prey is the tauntaun, another creature native to the ice planet. 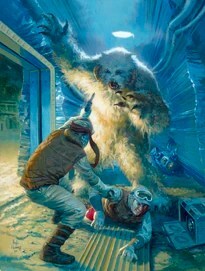 The wampa have adapted to survive in the harsh weather of their native planet and have become consummate hunters, using the environment to their advantage and striking their prey from ambush. Luckily for their prey, they are usually solitary hunters, but have been known to travel in packs to take down larger game. The Rebel Alliance’s Echo Base fell victim to more than one wampa attack during it’s use as a base of operations. Though they were rarely seen off of Hoth, they were known to be used in underground gladiatorial combats and were considered to be a worthy trophy for the big game hunter, their pelts and other parts commanding high prices on the black market. Ferocious is an ability I’ve been toying around with for a while, and it may simply become an ability that all beasts (or at least the more dangerous ones) get in games that I run, simply by virtue of the obvious danger they present to a person who is in their sights, allowing them to use their usually much higher Brawn characteristic to try to scare off potential foes instead of their often lacking Willpower. Only time and additional playtesting will tell if it stays or if it goes, but it’s a decent thought exercise. Like what you see? Any suggestions? Play reports? Thoughts on Ferocious? Let me know in the comments! I like the Ferocious quality, and may snag it for my own beast NPCs. The damage rating is definitely on the nasty side of things, as a single hit will leave a lot of starting-tier PCs badly injured. Maybe downgrade it to Brawn+2, especially as it’s got a pretty good Brawl skill pool to start with on top of two ranks of Pierce? It’s still nasty, but not a near death-sentence for newbie PCs. Beyond that, it’s a solid build. Nice work. Yeah, the weapon quality section is actually in error. It’s only supposed to be Pierce 1. That’s just a typo I didn’t catch on my part. Though I could definitely see lowering the damage by one point on top of reducing Pierce by one as well with the Brawl pool being as high as it is.